Located in the heart of Provence, this 200 m2 villa easily sleeps 12 persons. Large outdoor area including outdoor kitchen and dining area. 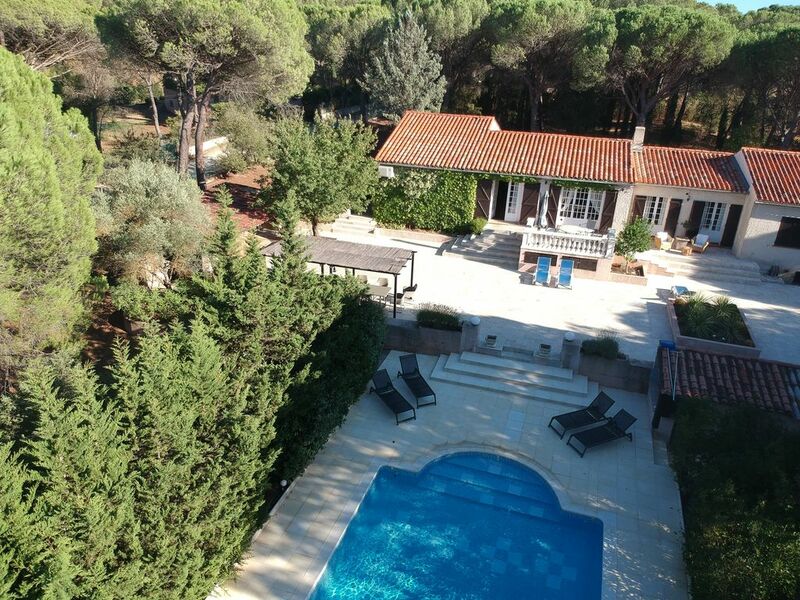 5 bedrooms, 2 new bathrooms plus one , pool house with toilet and shower, large new kitchen in Provençal style, large terraces with shaded areas, large boule-track with light for evening entertainment, large pool also suitable for children, safe area, electrical gate, 35 km to the beaches of St Tropez, 4 km to the beautiful village Vidauban, 6 vineyards in walking distance from the villa. Many great golf courses nearby. Pease note that we only accept bookings from Saturday until Saturday. We looked at at least 10 properties before we bought this one. Perfect and sheltered neighborhood. Great layout of house / garden. The outdoor area is unique and needs to be seen! The presentation, the location, the privacy and the area in general. 2 of the 3 bathrooms are new in 2015 and built with the finest materials available. toilet, combination tub/shower, En suite master bedroom. New 2015. High standard. toilet, combination tub/shower, En suite. New 2015. High standard. The master bathroom is complete with shower and toilet. The second bathroom is with shower and with toilet nearby. There is also a shower and a toilet by the pool. Enough parking for min 5 cars. Free wifi works also outside. AC outlet outside for charging phones & PC´s. Huge kitchen very suitable for provencal cooking. We have even arranged cooking classes here. Fully equipped. Solid oak table seating 8. Plus a provencal iron table in the kitchen, seating 4. Outdoor dining facilities includes 3 tables seating 6, 12 and 10 persons. Lots of DVDs available for our guests. 500 m2 of terraces. All new in 2013. Beautifully planted with olive trees and lavande. This is where our guests spend most of the time. The garden is 5000 square meters and offers privacy. Next to the pool area is the boule-track. A perfect spot to relax with a glass of wine. The whole property is very well suited for children. It is all fenced in with electrical gate opener. We have satellite with Scandinavian and British TV channels. In the outdoor kitchen we have newly installed a genuine wooden pizza oven. Fire logs we supply from the garage. Arriving on a hot Saturday afternoon, finding the fridge full was a perfect start of our fantastic week in the villa. Driving from Norway our satnav took us right to the front door at the first attempt. Property was freshly cleaned upon arrival and renting this villa is easy to recommend. Privat pool area and outdoor kitchen with both BBQ and wood-fired pizza oven made our stay comfortably. Vidaubans proximity with it`s markeds was also a good experience. Dinner at La Petite Fontaine in La Garde-Freinet is also recommended. Fantastisk sted for familieferie! Denne eiendommen er noe av det flotteste vi har sett passet perfekt til ferie for storfamilien på 15 personer. Gedigen terrasse med flere spiseplasser og stort basseng. Huset var rent og pent og bassenget ble rengjort 2 ganger i uken. Takk for supert opphold - vi kommer igjen! ideale plaats om te verblijven met meerdere mensen veel slaapkamers bbq buiten en familietafel... ook het dorpje dichtbij is heel leuk... en alle bekende plaatsen zoals nice cannes tropes.. allemaal binnen n uurtje te rijden..
Great property! Perfect for families. An impressive property with 5 bedrooms. Perfect for families. A beautiful Place! Villa Foncabrette delivered! Full of charm! Heerlijk huis met een schitterend zwembad. Hert interieur is een beetje gedateerd, maar knus. Heerlijk rustig gelegen, mooie terrassen, grote tuin, ideaal voor een groep van 10 tot 12 personen. Close to the spectacular Gorges du Verdon, Grand Canyon du Verdon, Lac du St Croix, 35 km from St. Tropez with it`s beautiful Saturday market. Even better is the Sunday market in our own Vidauban (4 km) or the Tuesday market in Lorgues. In Lorgues you also find the famous restaurant Brunos. Vidauban has appr. 6.000 inhabitants and have several bakeries, butchers, supermarkets etc. Several great golf courses within 15 minutes drive away. 6 wine castles within walking distance. 1 km from the house runs the river Aile with is`s old mill ruin. Perfect for walking. The boat from Toulon takes you to the wonderful islands Porquerolles. 90 km from Nice Airport. 110 km from Monaco. 80 km from Aix en Provence. Half an hour to Grasse and to several art museums, i.e. Picassos home in Antibes. Golf: Several great golf courses within 20-30 minutes drive. Saint Maxime, Roquebrune, Brignoles are just a few examples of great courses nearby. Ski: Isola 2000. Between 1,5 - 2 hours from Villa Foncabrette. Final cleaning, NOK 650, linen and towels NOK 100 per person. 100 NOK is approx. 10GBP or 12 Euro. Actual cost for electricity will be added on rentals from October until April.